We started the ‘Café français’ in the library about four years ago – zut! And in that time, our youngest member has left school and graduated from University! 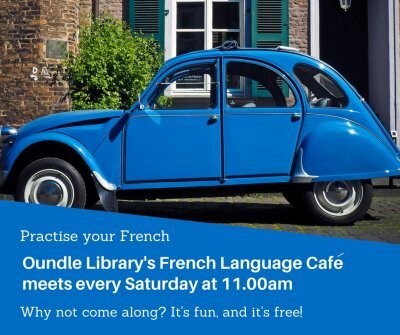 There’s only one rule – for an hour, we only speak French. Nevertheless, everyone is welcome, whatever your skill level. Come as often as you like, when you can. And if you prefer to just listen for the first few mornings, that’s no problem. As a fluent French speaker, I’m happy to help with pronunciation, but it is definitely not a French Class. It’s a free get-together for people who want to immerse themselves in a Gallic atmosphere for an hour, once a week, if they are free. Why not come along to a session and give it a try?